It has been awhile since I have blogged. A long while! Much of 2012 was busy with work and planning my wedding! It was a very unique experience to be the bride. I learned so much about myself as the bride and as a photographer by just being on the other side! The ups and downs have made me more appreciative of what brides and grooms go through. Murphy’s Law caught us off guard a few times, that’s for sure! So, you may be wondering who the elephant in the room was. Stomper was our surprise guest! My sister-in-law and her boyfriend hired him because my husband is an Oakland A’s fan. It was a great way to entertain our guests during Cocktail Hour. He was a hit! It was Stomper’s first time to be hired for a wedding. AND, he wore this tuxedo for the first time. 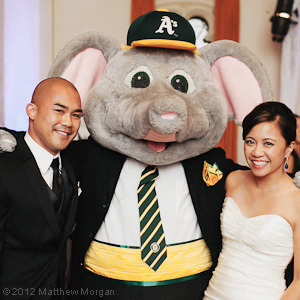 If you or anyone you know loves the Oakland A’s and would want to hire Stomper – go for it! He set the tone for our wedding. It was so fun and memorable. After all the wedding planning, that’s what it’s all about!